This major handbook covers the structural use of brick and blockwork. A major feature is a series of step-by-step design examples of typical elements and buildings. The book has been revised to include updates to the code of practice BS 5628:2000-2 and the 2004 version of Part A of the Building Regulations. New information on sustainability issues, innovation in masonry, health and safety issues and technical developments has been added. Curtins Consulting Engineers is a medium sized firm of structural engineers with 11 offices in the UK. 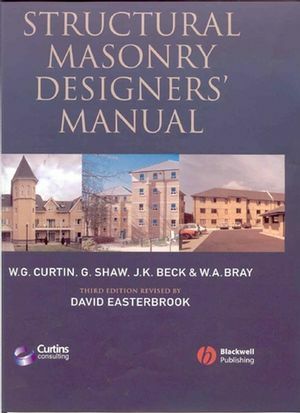 They are well known for their work on foundations and have also authored another book with Blackwell Structural Masonry Designers’ Manual (third edition due 2005). Dave Easterbrook - Lecturer, School of Engineering, University of Plymouth.